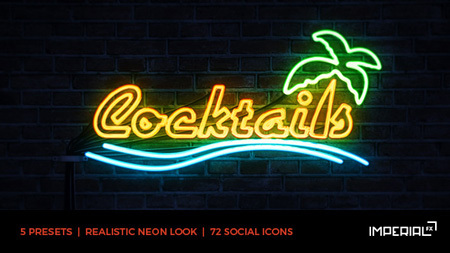 Neon Light turns your logo into a neon sign! With the simple controls you can adjust the look from bright and happy to dark and gloomy with just a few clicks. The blinking animations are automatically generated from your input! You don’t have to set a single keyframe. Use any logo or image with alpha channel or use masks to draw your own image directly in After Effects. Version 2 features an even more realistic look, faster render time and easier controls! In addition there is a “Minimal Mode” which turns off all details like cables and clamps. Perfect if you want to use your neon sign on top of images. Supports After Effects CS4 and higher. No plug-ins required. No pre-rendered files. Full HD 1920×1080 resolution at 29.97 fps. The sound from 0:00 to 0:12 is included. 5 Floor textures to choose from. All templates of the preview video are included, except the envato and the ImperialFX template.